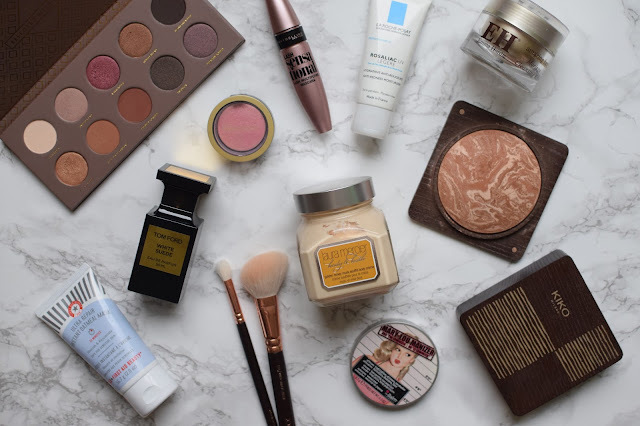 I'm always very interested to hear what beauty products really made a stand out impression over the year to them, I love recommendations, so I thought I would follow suit and round up my own favourite beauty products of 2015! The Zoeva Cocoa Blend Palette definitely sticks in my mind, so affordable and such gorgeous wearable, blend-able shades. My favourite mascara has to be the Maybelline Lash Sensational, super affordable and makes your lashes so long and thick. I've been loving the La Roche Posay Anti-Redness Moisturiser, great for in the morning and sits well under makeup. A cleanser revelation last year was the Emma Hardie Cleansing Balm, a bit pricey but such a gorgeous nourishing cleanser. My blusher favourite has to be the Max Factor Creme Puff Blush in Lovely Pink, these are so so good for being a drugstore product, fab colour payoff and so blend-able and glowy. A perfume that I absolutely love, again a pricey one the Tom Ford White Suede, it's definitely my most grown up fragrance but it's so nice! I've also been loving the First Aid Beauty Ultra Repair Instant Oatmeal Mask, so so good for dry skin! A set of brushes I've been obsessed with is the Zoeva Rose Gold brushes, such good value for money, great quality and look at how pretty they are! I've loved smothering my bod in the Laura Mercier Golden Honey Musk Soufflé Body Creme, it smells amazing! The bubble bath is also beaut! I've discovered this Kiko Bronzer, the packaging is gorgeously ridiculous, but it's just a lovely glowy bronzer. Finally my all time favourite highlighter from last year is The Balm Mary Lou-Manizer, just a fab lit from within pot of sparkly amazing-ness! What have been your Beauty Favourites in 2015? Oh my goodness, that palette is gorgeous! I've yet to try anything from Zoeva, but I keep hearing good things about the items. I've had Laura Mercier bath products on my wishlist for ages. They smell so good! I've been loving the Zoeva Cocoa Blends palette its so lovely and also loved my Max Factor Creme Puff Blush throughout 2015 as well! Lovely post!